Calculus: Multivariable, 7e continues the effort to promote courses in which understanding and computation reinforce each other. The 7th Edition reflects the many voices of users at research universities, four-year colleges, community colleges, and secdondary schools. This new edition has been streamlined to create a flexible approach to both theory and modeling. The program includes a variety of problems and examples from the physical, health, and biological sciences, engineering and economics; emphasizing the connection between calculus and other fields. Calculus: Multivariable, 7e will include Wiley's seamlessly integrated adaptive WileyPLUS ORION program, covering content from refresher Algebra and Trigonometry through Multi-Variable Calculus. 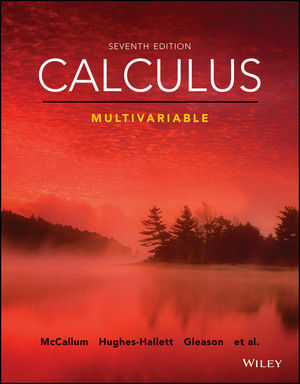 Calculus: Multivariable, 7e is the first adaptive calculus program in the market. Calculus: Multivariable, 7e continues using the "Rule of Four" approach created by the Consortium where ideas are presented graphically, numerically, symbolically and verbally, thereby ancouraging student with a variety of learning styles to expand their knowledge.